Acrylic Sign Holder is optimal for use in any limited space, Stands by itself on any table or desktop. Holds a variety of documents, brochure, photos, letter , food menu holder and etc functions. 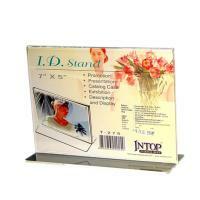 Clear Acrylic Brochure and Book Holder #B-348 4x10.2x21 cm. Horizontal Clear Acrylic Sign Holder Double Sided Display #A-343 10x8 cm. Horizontal Clear Acrylic Sign Holder Double Sided Display #A-332 9x6 cm. Horizontal Clear Acrylic Sign Holder Double Sided Display #A-232 7.5x5.5 cm. Horizontal Clear Acrylic Sign Holder Double Sided Display #A-222 6x4 cm.